Hi, I'm Jim, a.k.a. 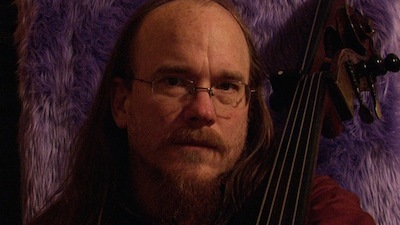 Jimi Jazz and I play string bass for G. Love and Special Sauce, and lead my jazz group, The Jim Prescott Trio. I'm super psyched to release my first CD with this group, while I'm returning the road with Special Sauce to celebrate the twentieth anniversary of our first record, which came out in 1994. You can follow my blog, where I post weekly chronicling my adventure returning to the touring lifestyle after five years of sabbatical in Portland Oregon. Join the mailing list for updates about G. Love and Jim Prescott performances and happenings. JimiJazzMusic.com connects the myriad of my projects and pursuits. Born in Vermont, Jim “Jimi Jazz” Prescott's formative years were spent in various North East and New England towns, completing high school at North Kingstown Senior High School in Rhode Island. Although presented with the opportunity to pursue fine arts in higher education, Prescott chose to a more practical degree in electrical engineering (BSEE '88) in the spirit of family tradition, as both of his Grandfathers were engineers. While at Boston University he explored the underground rock scene as a contrast to the rigors of the engineering program. After quickly learning electric bass Prescott formed his first band Liquid Nik, where he met musical prodigy Dave Watts (of late with the Motet) which later achieved minor cult status in the Boston area. He graduated from Boston University, and played in various other local outfits while pursuing a parallel engineering career working for AKG Acoustics Digital Products Division, where he helped to develop an early Digital Audio Workstation, and Cambridge Signal Technologies where he brought a revolutionary acoustic correction system to market. Unfortunately the market was not ready, (the industry is just catching up to the technology presented) and Cambridge Signal Technologies (SigTech) would not survive. Fortunately Prescott had his music career to fall back on, which had been building since switching to Upright (string) Bass, and pursuing jazz seriously, studying with Bruce Gertz of Berklee College of Music. At that most important of jazz institutions, the jam session, Prescott met Garrett Dutton, and, with drummer Jeff Clemens, formed G. Love & Special Sauce. In December of 1993 they completed their eponymous debut and the following year began a rigorous world wide touring schedule that would last nearly fifteen years. Highlights include multiple performances at some of the top festival in U.S., Australia, Europe and Asia, notably Glastonbury in the U. K. and the Fuji Rock festival in Japan. While on the HORDE tour in the mid 90's G. Love & Special Sauce acquired their college based following that supports the band to this day. Appearing in several MTV videos including the minor hit “Cold Beverages”, as well as the late night and daytime talk show circuit including, The Jenny Jones Show, Jimmy Kimmel, The Late Late Show, Late Night With Conan O'Brian and David Letterman, along with extensive club touring garnered the group a serious following of a certain age and musical disposition. Prescott's compositions with G. Love & Special Sauce have been featured in multiple major and independent films and television, notably Day Trippers, Cellular, and American Dad. Prescott co-produced major label 8 CD's with the band, working with legends like Dr. John, and producers as varied as Jim Dickinson, T-Ray, Chris D. and Mario C. the innovative Beastie Boys producer. With the experience of working in some of the worlds finest studios, Prescott relocated to the San Francisco Bay Area and created Loft Studios to record some of the jazz and new music coming out of the region at that time. His undeniable sense of style combined with the regional eclecticism in the beginnings of his multifaceted solo work that ranges from adult pop through all of jazz to avant-guard noise art and audio colage. In 2006 Prescott moved to Portland to form JamBox with All Fellas Band alumnus Jonathan Long and expanded his recording mission to the community while beginning a pursuit of his personal vision in film. The JamBox provided technology and space for detailed multi-track digital recording, in a relaxed setting designed for collaboration. Despite the success of multiple recordings and film and video productions JamBox closed in 2010 due to lease issues. After leaving G. Love & Special Sauce in 2008, Prescott returned to musical study with jazz legend Glen Moore, and an extended weekly jam session downtown. He currently collaborates in a variety of groups on string bass, leads his own groups and continues in audio production for film and video. In classic Portland fashion his expression has enlarged to include conceptual art and film making.